Every four years, the World Cup unites people from all over the world with the game of soccer. This past summer in Hamtramck, the International Soccer Academy (ISA) accomplished the same feat every week. Starting in July, the ISA began the 16th year of its free “Soccer-in-the-Park” program, with about 100 kids from the Hamtramck area, as well as around 200 kids from the west-side of Detroit, participating. Practices were held every Thursday, and inter-city games were played Saturdays on the west-side and Sundays in Hamtramck. In addition to regular league championships, the culmination of the season is the annual three-on-three tournament dubbed the “Hamtramck International Cup,” which was held recently at Veterans Memorial Park. 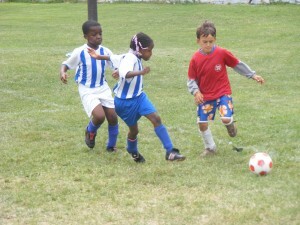 The round-robin competition featured 26 teams of kids with ages ranging from 6 to 16. The players represented over a half-dozen nationalities from four continents. A total of 84 games were played over the two-day event, which cost participants just $6 and included a trophy for all who played. Even those not able to afford the fee were allowed to play. The affordability of the game is what makes it inherently and universally accessible. Unlike other sports that require expensive equipment, a game of soccer can be played with just a ball. And through the game many other fundamental life skills can be developed. It’s a realization that ISA founder and director Denise Henry came to back in 1993, when she started the program with just six kids. Brigitte Bauman, a parent-volunteer from the Detroit community, confirmed the benefits of the game and praised Henry’s dedication. In addition to providing benefits to players and parents, the ISA’s program also works to help improve the community as well. This year they brought in 10 cubic yards of dirt to fill-in uneven patches in Veterans Park, and next year they plan on planting grass to complete the resurfacing. Many of the players who come up through the program often become contributing members to their community. The referees certainly had their hands full during the three-on-three tournament. With four fields hosting six age brackets that played at least three games each, the action started Saturday around noon and went non-stop until 4 p.m., with championship play resuming at noon on Sunday. The results of the top two teams from each age bracket are as follows: U-6 Division: Everyone’s a winner; U-8: 1st Place Argentina, 2nd place Crossfire; U-10: 1st Place LA Galaxy, 2nd Place Real Salt Lake; U12: 1st Place Houston Dynamo, 2nd Place Jordan; U-14: 1st Place Brazil, 2nd Place England; U-16: 1st Place A.C. Milan, 2nd Place Detroit Diesel; Parents Game: Brazilian Raiders. The International Soccer Academy is a volunteer-based grassroots organization that seeks to bring an affordable soccer program to communities throughout the Detroit area. For more information or sponsorship opportunities contact Denise Henry at (248) 792-1316 or by e-mail at soccer@telemedtec.com.